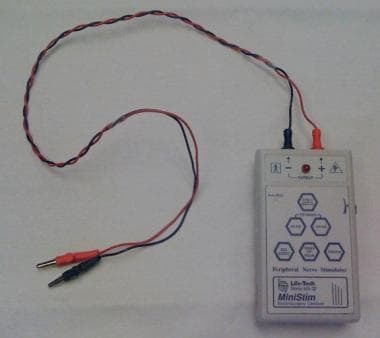 A peripheral nerve stimulator, also known as a train-of-four monitor, is used to assess neuromuscular transmission when neuromuscular blocking agents (NMBAs) are given to block musculoskeletal activity. By assessing the depth of neuromuscular blockade, peripheral nerve stimulation can ensure proper medication dosing and thus decrease the incidence of side effects. Peripheral nerve stimulation is most commonly used for ongoing monitoring in the intensive care unit (ICU). NMBAs are used to decrease the work of breathing and facilitate mechanical ventilation in the most critically ill patients. Peripheral nerve stimulation monitoring during NMBA administration results in use of less medication, which can allow for quicker recovery of spontaneous ventilation and accelerated neuromuscular transmission recovery when the NMBA is discontinued. Relative contraindications include burns, hemiplegia, hemiparesis, and peripheral neuropathy. Receptors may be resistant to NMBAs and lead to excessive doses. Peripheral nerve stimulation is used to assess neuromuscular transmission when NMBAs are given to block musculoskeletal activity. Nondepolarizing NMBAs such as pancuronium, rocuronium, and cisatracurium are most frequently used. They act by competitively blocking the binding of acetylcholine to its receptors. They have slow onset of action and long duration. Cisatricurium (Nimbex) tends to be the agent of choice because there is a lower incidence of nephrotoxicity and hepatotoxicity. The depolarizing blocking agents, such as succinylcholine, act instead by depolarizing the plasmatic membrane of the muscle. They have rapid onset of action and short duration. They may cause hypertension, hyperkalemia, arrhythmias, an increase in intracranial pressure, and (less often) malignant hyperthermia. For this reason, they are only used for short procedures. Because neuromuscular blocking agents are only paralytics (ie, they lack amnesic, sedative, and analgesic properties), simultaneous administration of analgesia or anxiolytics is mandatory. Most education initially will be with the family members present at the bedside because the patient is heavily sedated. Explain that the peripheral nerve monitoring will guide how the medication is dosed. Explain that the peripheral nerve stimulation will help to assess the effect of the medication. To reduce any anxiety, describe the equipment and the experience of the stimuli as a slight prickly sensation that the patient may or may not experience. Determine the baseline electrolyte levels. Electrolyte imbalance can potentiate neuromuscular effects. Determine blood urea nitrogen and creatinine. Renal dysfunction can prolong duration of action. Sedation and analgesia should already be administered. The head should be elevated at 30-45 degrees if supine for the prevention of ventilator-associated pneumonia. The patient needs to be turned frequently, at least every 2 hours. Skin should be assessed regularly to avoid pressure ulcers. The extremity being stimulated needs to be visible. The peripheral nerve stimulation itself can cause some discomfort or tingling. Assess for a site that is clean, dry, shaved/clipped, nonedematous, and free of an intravenous or intra-arterial line. Diaphoresis, hair, edema, wounds, dressings, and catheters can interfere with the conduction of the stimulating current through dermal tissue. Assess and correct any electrolyte abnormalities that may interfere with testing, such as hypokalemia, hypocalcemia, hyponatremia, or hypermagnesemia. The peripheral nerve stimulation can be performed either in the ulnar, facial, or posterior tibial nerve. The ulnar nerve in the wrist is the preferred site, but if gross anasarca is present, the facial nerve is then usually the site of second choice. If the clinical situation is not emergent, whenever possible apply the electrodes to determine the best site of location by testing the train-of-four response and finding supramaximal stimulation level prior to NMBA initiation. Supramaximal stimulation is the level at which additional stimulation will not increase the intensity of the 4 twitches. It is a baseline for comparison and establishes what the adequate stimulating current is prior to NMBA therapy. Extend the arm, palm up in a relaxed state. The 2 electrodes are placed over the path of the ulnar nerve. The distal electrode is placed at the level of the wrist on the ulnar surface at the flexor crease, as close to the nerve as possible. The second electrode should be placed 1-2 cm proximal to the first, parallel to the flexor carpi ulnaris tendon. The negative (black) lead wire is attached to the distal electrode and the positive (red) lead wire is attached to the proximal. The expected response is to see the thumb twitching. The first electrode is placed on the face at the outer canthus of the eye and the second electrode is placed 2 cm below, parallel with the tragus of the ear. Connect the negative (black) lead wire to the distal electrode at the tragus and the positive (red) lead to the proximal electrode at the outer canthus, as shown in the image below. 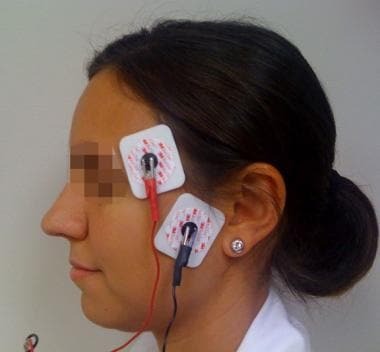 Electrode and lead placement for peripheral nerve stimulation: Facial nerve. The stimulus will produce eyebrow twitching. The first electrode is placed 2 cm posterior to the medial malleolus in the foot, with the second being 2 cm above the first. Connect the negative (black) lead to the distal electrode at the posterior malleolus and the positive (red) lead to the proximal electrode above the malleolus. The stimulus will produce plantar flexion of the great toe. When pressing the train-of-four button, the stimulus is sent as a group of 0.2-millisecond pulses (to avoid direct muscle stimulation or repetitive nerve stimulation going over the refractory period) in a square-wave pattern spaced 500 milliseconds apart. This is repeated every 10 seconds. Turn on the peripheral nerve stimulator and select a low amplitude, usually 10 or 20 mA to start. Increase the current in increments of 10 mA until 4 twitches are observed. Note the current (in mA) that corresponds to 4 vigorous twitches when the train-of-four stimuli button is pushed. If there is then no increase in the intensity of the 4 muscle twitches when the current is increased by 10 mA, the supramaximal stimulation is the level at which the previous 4 vigorous twitches were observed. For example, if 4 strong twitches are observed at 50 mA but when raised to 60 mA there is no further increase, the supramaximal stimulation is then 50 mA. To decrease the current required to stimulate a nerve, the positive electrode is placed proximally and the negative toward the muscle terminus. The wires are connected to the nerve stimulator. The negative (black) and positive (red) leads are attached to the corresponding connection colors. When 4 twitches are seen, 0-75% of the receptors are blocked. When 3 twitches are seen, at least 75% of the receptors are blocked. When 2 twitches are seen, 80% of the receptors are blocked. When 1 twitch is seen, 90% of the receptors are blocked. When no twitches are seen, 100% of receptors are blocked. Retest the train-of-four 15 minutes after a bolus dose or with a change in a continuous NMBA infusion rate, titrating to the prescribed clinical endpoint. Once the prescribed clinical endpoint has been met with a steady level of blockade and the patient is clinically stable, retesting intervals can increase to every 4 hours. Perform the stimulation first at baseline, then 15 minutes after a bolus if continuous infusion every hour until stable, and then every 4 hours. Check the lead connections and change the battery if needed. Make sure the skin and electrodes are clean and dry and replace electrodes if necessary. Increase the stimulating current because it now may be inadequate, especially with anasarcic patients. Retest another nerve to verify that this is not a false-zero response. If there are no other explanations for the zero response, it is assumed to be a true lack of response. Reduction of the NMBA infusion rate is indicated in order to prevent prolonged paralysis and severe weakness during ICU recovery. The next dose of bolus NMBA needs to be held, or the infusion can decreased by 50% and evaluated after 15-30 minutes. Until only 1 or 2 twitches are seen, the monitoring needs to be performed every 15-30 minutes. Sen S, Sari S, Kurt I, Cobanoglu M. The use of train of four monitoring for clinical evaluation of the axillary brachial plexus block. J Clin Monit Comput. 2014 Jun. 28 (3):243-9. [Medline]. Lien CA, Kopman AF. Current recommendations for monitoring depth of neuromuscular blockade. Curr Opin Anaesthesiol. 2014 Dec. 27 (6):616-22. [Medline]. Bhananker SM, Treggiari MM, Sellers BA, Cain KC, Ramaiah R, Thilen SR. Comparison of train-of-four count by anesthesia providers versus TOF-Watch® SX: a prospective cohort study. Can J Anaesth. 2015 Oct. 62 (10):1089-1096. [Medline]. Lippincott. Nursing2010 Drug Handbook. Philadelphia: Lippincott Williams & Wilkins; 2010. Murray MJ, Cowen J, DeBlock H, Erstad B, Gray AW Jr, Tescher AN. Clinical practice guidelines for sustained neuromuscular blockade in the adult critically ill patient. Crit Care Med. 2002 Jan. 30(1):142-56. [Medline]. Rudis MI, Sikora CA, Angus E, Peterson E, Popovich J Jr, Hyzy R. A prospective, randomized, controlled evaluation of peripheral nerve stimulation versus standard clinical dosing of neuromuscular blocking agents in critically ill patients. Crit Care Med. 1997 Apr. 25(4):575-83. [Medline]. Whetstone Foster JG. Peripheral nerve stimulators. D J. Lynn-McHale & K Carlson. AACNProcedure Manual for Critical Care. Elsevier Saunders: Philadelphia; 2005. 837-844.